Onaga (Etelis coruscans) | Better Know a Fish! “I always enjoy learning from you, chef,” I said to the man behind the sushi bar. The Japanese man smiled back, and cocked his head briefly in a polite, acknowledging nod. “And I wish I had more customers like you,” he replied. 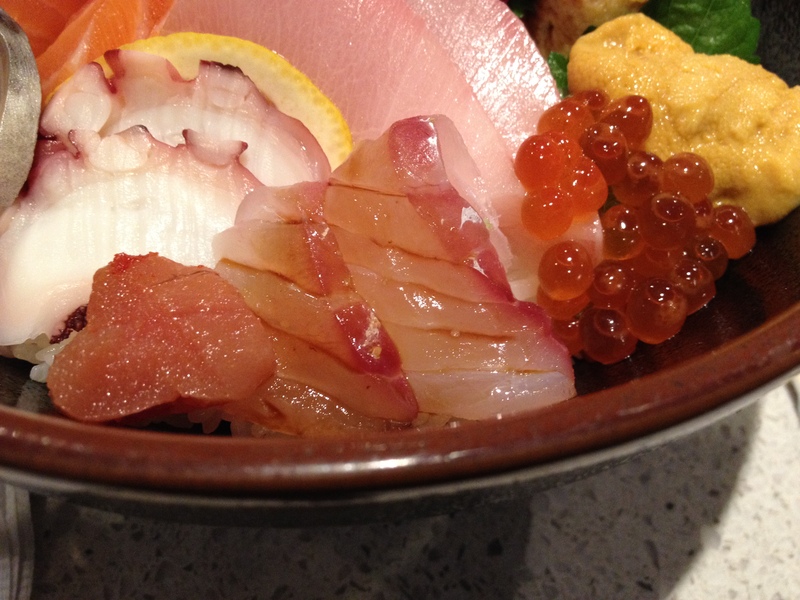 Then his head of tussled, bleached-blond hair bowed to focus on the next dish at hand, and my head bowed to the bowl of chirashizushi before me. I make a regular pilgrimage to this chef — who has a preference for privacy and does not like his name used, a preference I gladly respect for all the wonderful tastings and conversations he has shared on all my visits. 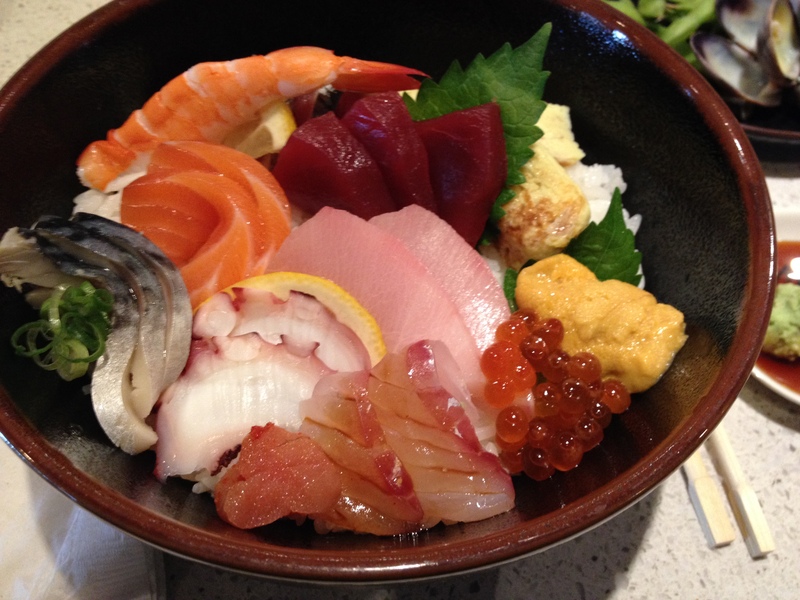 I would make my usual order of chirashizushi — a medley of sliced fish fillets (sashimi) and shellfish over a bowl of sushi rice. It is a convenient way to taste a variety of fish species, and a chance for the chef to sneak in a sample of the rare or unusual. This week, the extra treat was onagadai or onaga, the deepwater longtail red snapper (Etelis coruscans). L’ételis flamme… is a large and beautiful fish, which the fishermen of Réunion call le Vivaneau flamme, because of the vivid and brilliant red color which it is painted. Flamme means flame, and vivaneau is a French name for fishes in the family Lutjanidae, the snappers. The snappers are more than 100 species of predatory fish found in tropical and subtropical waters worldwide, with many species common in recreational and commercial fisheries, such as the red snapper (Lutjanus campechanus) commonly traded in the East Coast of the United States. The name “snapper” can be particularly confusing in the United States, because on the West Coast it can be erroneously used for rockfishes (Sebastes spp. ), another group of commonly sold food fishes. True snappers live in different depths, depending on the species. Some are found in mangrove forests, estuaries and shallow coral reefs, while others are found in deeper waters. The onaga, for example, are caught in depths 600 to 1,000 feet (180-300 m), and up to 1,400 feet (450 m) in some places. “That’s why it’s so expensive,” the chef said, interrupting my admiring gaze at the fillets. A subtle, winking boast of his pleasure to share such a prize. You can tell that onaga prefer a certain depth of water by its red color and large eyes. These are common traits in fish that are active at night or in depths where little sunlight penetrates. The red wavelengths of sunlight are the first to be absorbed by water and lost with increasing depths. Animals with red coloring will appear as dark blue instead, blending into the surrounding waters. Large eyes allow the creatures themselves to sense whatever sunlight remains available, as well as any bioluminescence — biochemically generated light. And scientists are only beginning to understand how fish reflect and sense ultraviolet light — the entirely foreign language of biofluorescence, undetectable by human eyes. Onaga and hamadai are the names for Etelis coruscans in Japan. The species can be found elsewhere in the Western Pacific Ocean and the Indian Ocean. It is also well-known in the Hawaiian Islands, where the traditional name is ‘ula’ula koa’e — “the red snapper with the tail like a tropicbird” (Titcomb 1972). I smiled and thanked him again, bowing my head. And onward the onaga went, into other depths. Amesbury, S.S., and R.F. Myers. 2001. Guide to the Coastal Resources of Guam, Vol 1. The Fishes. www.uog.edu/marinelab/fish/thefishes.html. Titcomb, M. 1972. Native use of fish in Hawaii. University of Hawaii Press. 175p. Valenciennes, A. 1862. Description de quelques espèces nouvelles de poissons envoyées de Bourbon par M. Morel, directeur du Muséum d’Histoire naturelle de cette île. Comptes Rendus Hebdomadaires des séances de l’Académie des sciences v. 54: 1165-1170; (suite) 1201-1207. This entry was posted in Actinopterygii, Marine Fish, Perciformes and tagged 'ula'ula koa'e, deepwater longtail red snapper, Etelis, Etelis coruscans, flame snapper, foodfish, hamadai, Indian Ocean, Lutjanidae, onaga, onagadai, Pacific Ocean, Perciformes, ruby snapper, sashimi, snappers, vivaneau, vivaneau flamme, vivaneau la flamme, yellowstripe snapper. Bookmark the permalink. Pingback: Medai (Hyperoglyphe japonica) | Better Know a Fish!